Tell the rest of them I will send them a card later. I am about fixed up. I have no tidies for nothing in my room but I am well. Feel somewhat lonely. I have no one. 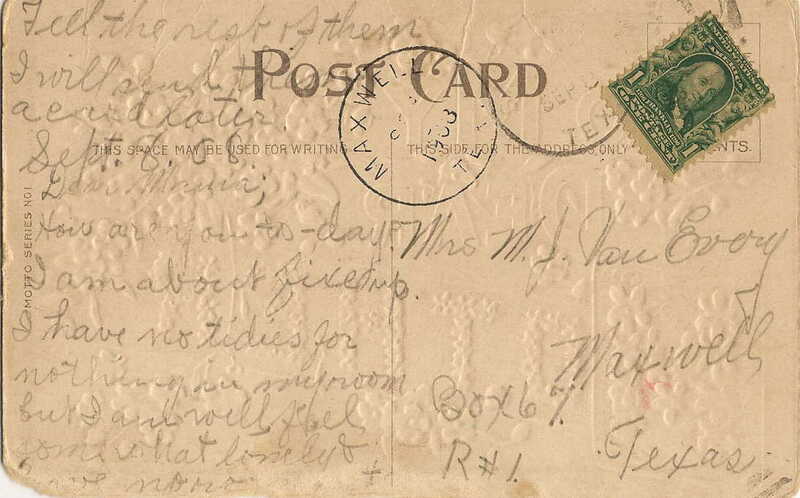 1) The card isn't signed, but the handwriting matches the one Sam sent his mother in December of 1909. 2) I'm guessing this postcard dates the breakup between Samuel and his first wife, Esther. Samuel and Esther's son, Everett was born in August of 1906, so they were together for about 2-3 years. This postcard was sent from Maxwell, Texas, suggesting Sam first attempted to set up a home in his hometown. However, by the postcard in December of 1909, he had moved to San Francisco. Esther and Everett remained in Austin, Texas. 3) I am guessing a bit on the last few words of the transcription. 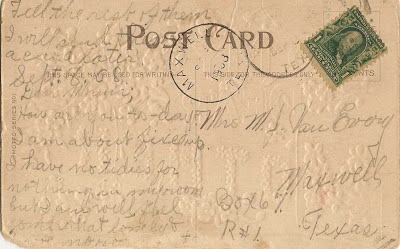 4) Some may notice Sam addresses this postcard to "Mrs. M.J. Van Every," but addresses the December 1909 postcard to "Mrs. M.E. Van Every." The difference between the two is whether he uses the initials of his mother (Margaret Jane), or those of his father (Melvin Elijah).